"Defrag what you want to and not what you're forced to with WinContig." WinContig is a free disk defragmentation application that gives you to have a lot more power and control over what you want to defragment. Most ther disk defragment applications scan the entire file system in order, even when your goal is only to defragment a single or couple of files. This forces you to have to go through seemingly endless wait times as your processor works to defrag your computer. This is not so with WinContig. 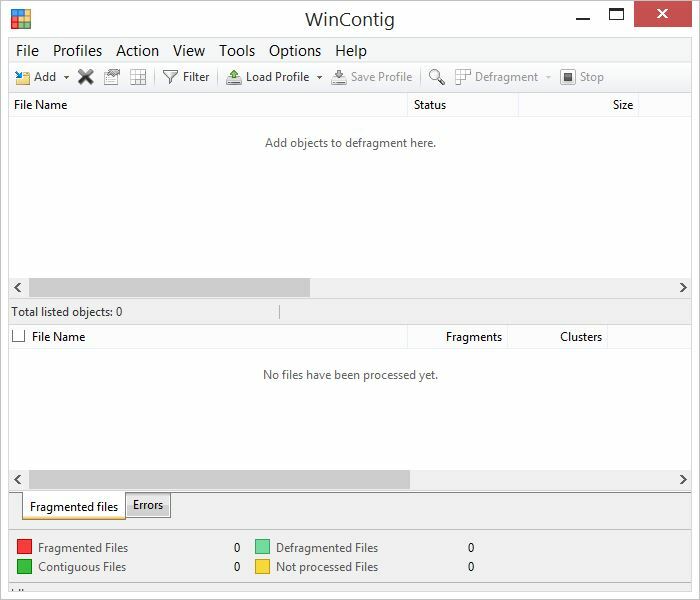 Because WinContig allows you to undergo the defragmentation process with a specific file or a specific set of files, you do not have to wait long a longtime for the it to complete. It would not have made much sense if an application allowed you to defrag a specific file or a specific set of files and only be able to analyze the entire system. Luckily the development behind WinContig allows for the application to make perfect sense. You can analyze the fragmentation progression of one file or a set of files just like you could during the defrag process. One of my favorite features of WinContig is the ability to save a set of files into a profile so that I can later check/analyze the programs for fragmentation and defrag only those set of files. It is very convenient and it can greatly benefit you too if you know that you will constantly work with the same specific set of files more often than not. With this feature, you don't have to go squandering away precious time while searching for each and every file that needs to be analyzed to obtain its fragmentation progression or in order to defragment and, instead, already have the files at hand and ready to go. Another great feature of the WinContig application is that it does not have to be installed on your computer; it is a standalone application that you can simply double click and get access to all of its glory. This allows the application to be more portable as well as it can run on any other system just like it would on your own. If one of your friends or family members are having speed issues with their computer, simple copy over the file and run it. One other thing to note about WinContig is that when you open the application, an external .dll application is automatically generated. You need not worry about it though, as it does not write any information to your system's registry. This does not mean that you should delete the external file as it could have some repercussions if improperly altered. The best thing about WinContig, as is any other application that has the following charateristic, is that it is completely free to download, free to use, and free to share. It doesn't matter if it is for personal use or commercial use, it is free and it will remain that way. Some other miscellaneous information about WinContig includes the application's ability to accept a number of option command-line commands that allow you to control the program's operations.